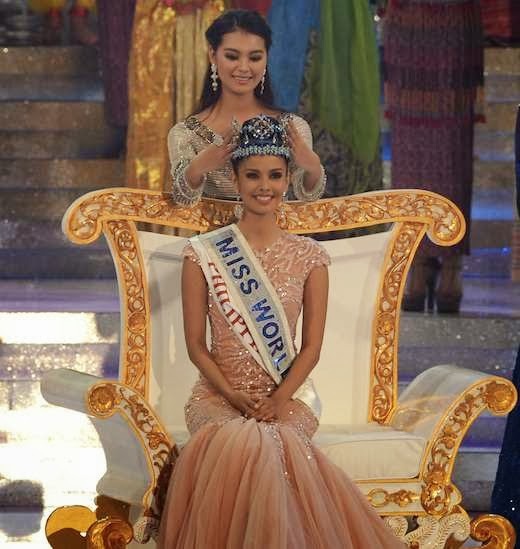 Megan Young was crowned Miss World 2013 on Saturday night in Bali, Indonesia, making history as the first-ever Filipino winner of the title since the Philippines' debut in the pageant in 1966. "I promise to be the best Miss World ever," 23-year-old Young said after winning the 63rd annual event, while a horde of Filipino fans who traveled to the Indonesian island with her celebrated, waving the country's flag. Young, who succeeds Wenxia Yu of China, the 2012 winner, was born in the United States, but moved to the Philippines when she was 10, where she went on to appear in films and work as a television host. Young's win was bolstered by her strong showing in various pre-pageant challenges, including the Top Model competition, which she won; the Beach Fashion tilt, where she ranked fifth; and the Multimedia Contest, where she placed fourth. The Kapamilya star was also one of the few candidates who had a solo spot in performing a dance from their respective countries. Young, for her number, showcased the Maranao dance Singkil. Miss France, Marine Lorphelin, took second place, while Miss Ghana, Carranzar Naa Okailey Shooter came in third. Miss World Philippines Megan Young also won the most coveted Miss World 2013 Top Model award over 126 other contestants from around the world. what a great moment for the country! She deserve the crown.. She's every inch a beauty queen.. Very stunning and captivating..
wow she is really pretty! she was very elegant that night and she made our country proud. loved that her family was there to support her and even one of the hosts loved her.